Buckingham Gold: The Morton | slate river ramblings . . . .
On July 14, 1838, a letter to the Editor ran in the Washington D.C. newspaper, Madisonian, for the Country. 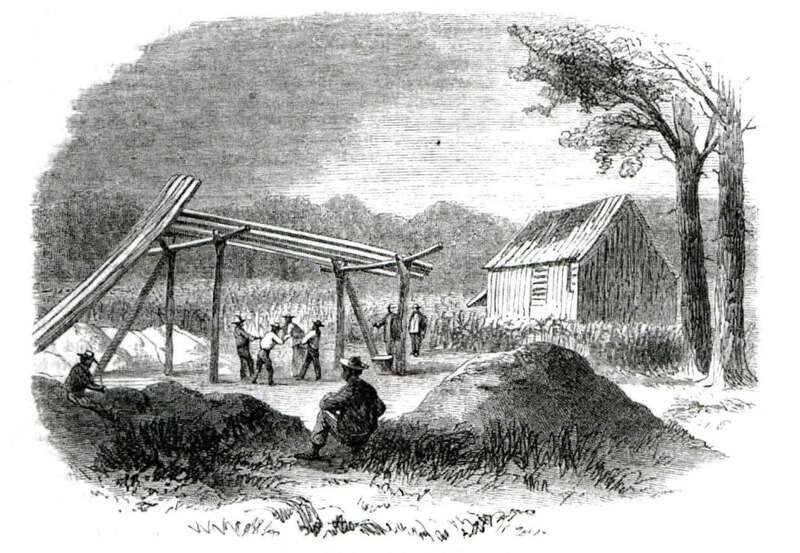 It was in response to “extracts from the New York Gazette, on the subject of Gold Mines in Virginia.” The letter discusses several Buckingham County gold mines which were active in 1838 and was signed, simply, BUCKINGHAM. The Morton mine has been opened by shafts . . . about one hundred feet deep – several veins cut – and the ores have been worked on a small scale, but with profit, for some three years. The motive power used in propelling the machinery is the water derived from a small creek, which was entirely insufficient, during most of last summer, to do anything. The veins are not very large, so far as opened, but they are sufficiently numerous and productive to justify the application of a considerable capital, and steam power, which is in contemplation by the proprietor. The present machinery consists of a Chilean mill, and stamps for crushing the rock, with the ordinary washers for separating the gold from the sands. This mine promises well, by good working, with proper machinery; but too little is done at present. Want to learn more about Buckingham gold mines? Put “gold” in the search box at Slate River Ramblings and enjoy the results!